One of the easiest ways to boost the readability and context of the text in a configuration file or your source code for various programing languages, is by using a text editor that supports “syntax highlighting”. Syntax highlighting is a simple but useful component in most if not all text editors that are used for programming, scripting, or markup languages, which enables for displaying colored text, notably source code, in different colors (and possibly fonts) corresponding to the category of terms. In this article, we will show how to turn on syntax highlighting temporarily or permanently in Vi/Vim text editor. VIM is an alternative and advanced version of VI editor that enables Syntax highlighting feature in VI. Syntax highlighting means it can show some parts of text in another fonts and colors. VIM doesn’t show whole file but have some limitations in highlighting particular keywords or text matching a pattern in a file. 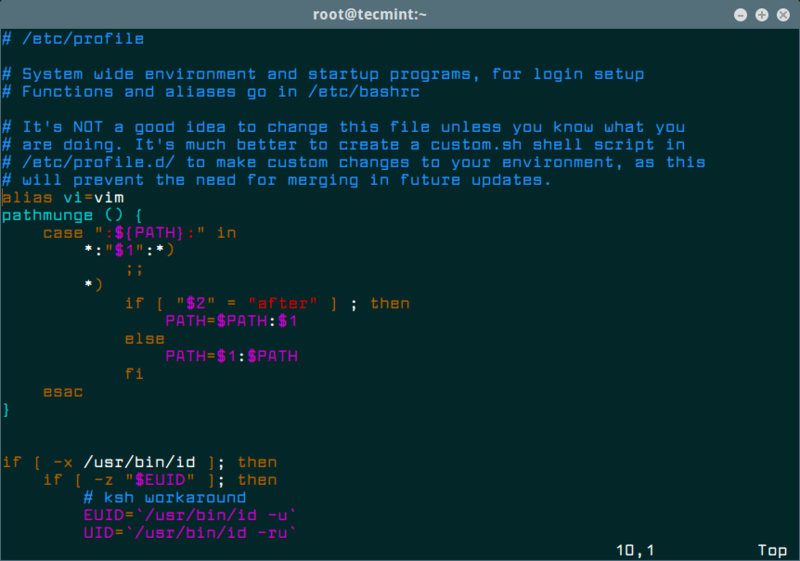 By default VIM works on all Linux terminals, but some terminals have minimal highlighting capabilities to run. VIM has another great feature that enable us to Turn Off or Turn On syntax highlighting using option syntax on and syntax off. Most of the Linux system already included VIM package, if not then install it using YUM tool. 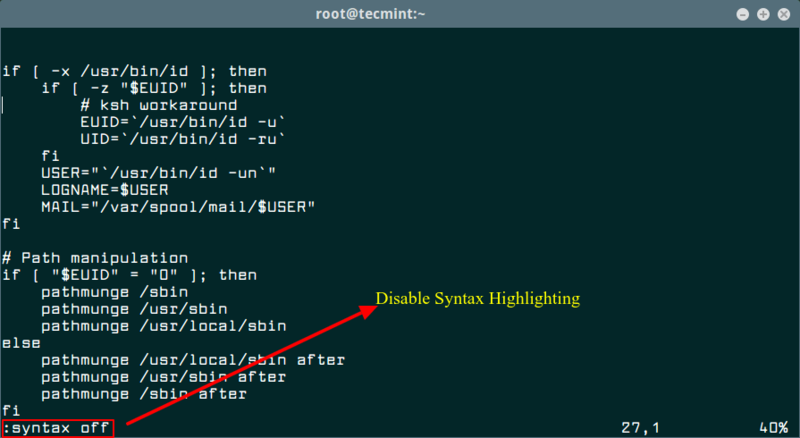 To enable Syntax Highlighting feature in VI editor, open the file called /etc/profile. Add the alias function to VI by pointing to VIM in /etc/profile file. This file is used to set alias functions globally. If you would like to set user specific aliases and functions, then you need to open the file .bashrc under user directory. Add the alias function. For example we set alias for tecmint user. After making changes to file you need to reset the changes by executing following command. Open any example code of file with vi editor. 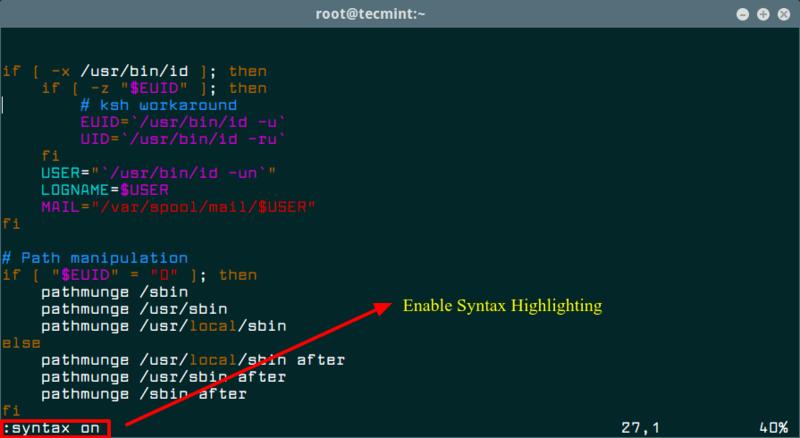 By default Syntax Highlighting is automatically turned on in /etc/vimrc file. You can Turn On or Turn Off syntax highlighting by pressing ESC button and use command as :syntax on and :syntax off in Vi editor. Refer example screenshots. You can share with us any other useful vi/vim tips or tricks you have come across, via the comment form below. :set syntax! will toggle the highlighting on and off. :set syntax? will let you know if syntax highlighting is off or on. vi is a symbolic link to vim if you have vim installed.